If you haven’t seen it yet Prusa’s i3 Mk3 MMU 2.0 printer module offers up multi-material printing using five pre-loaded filaments with a single extruder. The magic happens with a fairly ingenious filament selector module hanging out above the printer proper. And it works. The selector is adequate at selecting filaments and I’m not seeing much of an issue with it’s functionality. That’s barring wildly out-of-diameter filament widths (1.9mm+ instead of the spec 1.75mm). However, there seem to be some teething problems with the software design. One of the issues I’ve come up with on that end is the auto detection and alignment of the MMU 2.0 carriage. 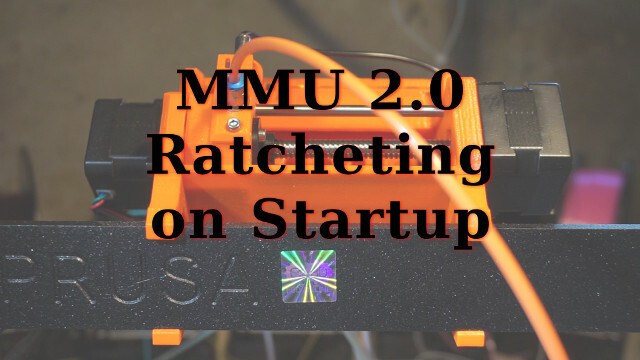 On start the MMU 2.0 seems to be detecting the right end of the carriage too soon. Then it hammers against the left side of the carriage when the MMU 2.0 moves back. It’s using resistance on the stepper motor driver and appears to be very sensitive. I’ve posted two videos, the first of it working properly and the second of the failing carriage detection. If you’re curious about the MMU 2.0 or are trying to check if what you’re own printer is doing is normal here you go.